Born five weeks early by emergency C-section, Adam Gretler was transferred immediately to Rady Children’s Hospital-San Diego for a complex, yet successful neonatal surgery. Soon after, Adam began experiencing a plethora of physical and behavioral delays that led to an autism spectrum diagnosis, requiring speech, occupational, and physical therapy, as well as countless hours of Applied Behavioral Analysis (ABA) therapy each week. From the NICU to weekly therapies, to an intricate heart surgery and a complicated abdominal procedure, the now 7-year-old boy has yet to live without health concerns. 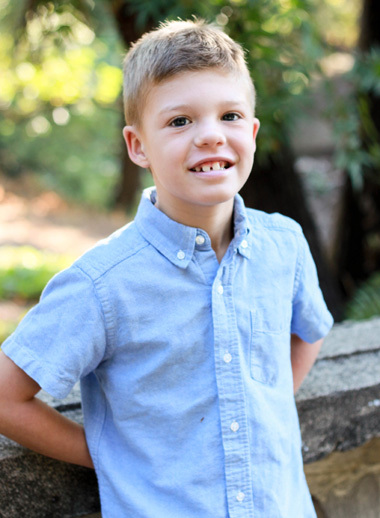 As participants in a recent genomic sequencing study through Rady Children’s Autism Discovery Institute in collaboration with UC San Diego, Erika and Darren Gretler, now the parents of two boys, learned what it means to stand at the forefront of a new medical frontier. The Gretlers became one of the few families in the U.S. where each member had their entire genome sequenced, providing immediate access to the specific biological material that informs human development, functioning, and behavior. Breakthroughs in genomics have generated new pathways for doctors as they aim to understand disease and provide hope to families like the Gretlers. This is an exciting point in time for physician-scientists working on the front lines of pediatric care – knowing the promise of personalized medicine is around the corner – giving assurance that every child will soon receive the right treatment at the right time. Thanks to the innovative work of President and CEO of the Rady Children’s Institute for Genomic Medicine, Stephen Kingsmore, MD, DSc, this promise is a much closer reality. Decoding genetic information from patients like Adam is advancing every day, and while this will ultimately improve the timing and accuracy of diagnoses, inform safer and more effective interventions, and even treat conditions before symptoms occur – the vast medical use for genomic information has yet to be fully understood. Without question, we are at a pivotal juncture in genetic medicine. This is the promise of personalized medicine; and Rady Children’s is at the forefront of realizing this future.